Tagged Amos Chapple, Chiatura, Georgia, Kanatnaya Doroga, rope roads, U.S.S.R.
Stalin’s Rope Roads Click on the title for a link to an article from The Atlantic. I love these types of photographs shown in this article. A look back into history with all the rust and peeling paint. Normally, blood seekers like mosquitos or my favorite the hairy legged vampire bat don’t find me tasty, but in Sri Lanka it was different. I was the flavor of the day with the local leeches in the Singharaja rainforest. I was aware leeches would be present but I did not expect the warm reception I received. There are two schools of thought when it comes to leech prevention, 1. Keep them away from your skin with long pants and leech socks/gaiters or 2. Sandals and shorts without gaiters. Method one you pick them off your clothes, method two off your skin. I used a hybrid method, leech gaiters and shorts. I could not stand walking around in long pants in the oppressive humidity. Leech gaiters = prevention. Not exactly, the gaiters are white to make it easier to see leeches. I discovered this when I returned to camp and found more leeches inside the gaiters then I pulled off on the walk. There are also a couple of schools of thought on when or if to pull leeches off. In my opinion, it doesn’t matter they are so highly evolved in the end they get what they want. They are harmless and do not transmit disease so I just got used to them. 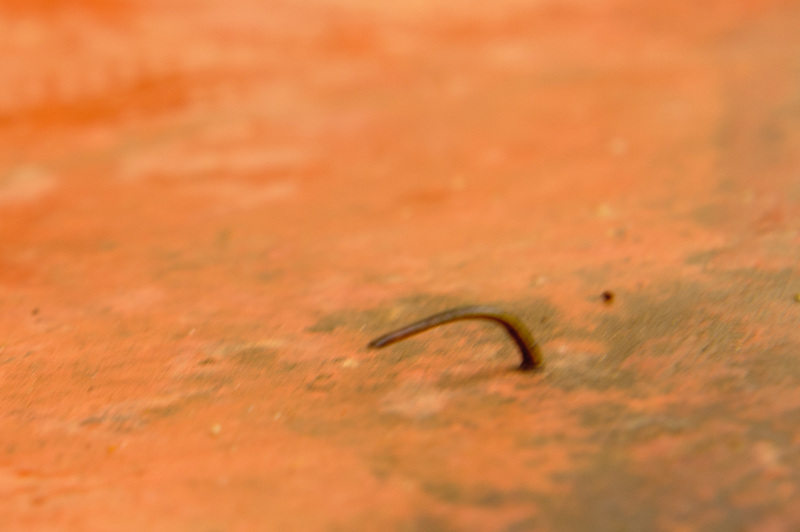 During a downpour, I sort shelter and had time to observe the leeches up close. They are fascinating. 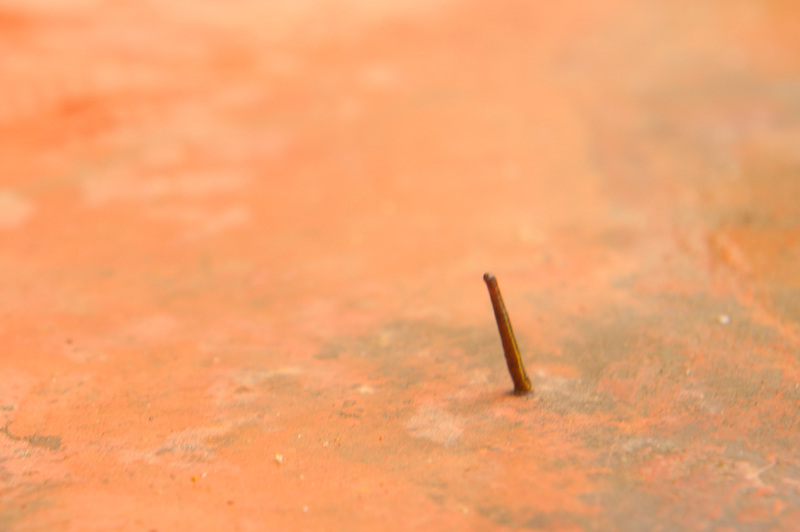 I picked one off my leg and dropped it on a rock. It begins by contracting into a thin mound. Perhaps it catches my scent, it triples its length and waves around like a cobra in a basket. Once it determined my location it took off like an inch worm on speed. Watching how fast it is, it is no wonder whenever I stop to take a photo I was immediately under attach. While reading about the leaches of Ceylon/Sri Lanka online I came across this fascinating account from the 19th Century. Click here to read from The concise guide to the Anglo-Sri Lankan lexicon by Richard Boyle – Part 13 “Hooked on leeches”. For the past few years whenever I visited Asbury Park, NJ a bike shop on the corner of Main Street and Springwood Ave always caught my eye. There was always something placed at the front door or a cleaver message on the blackboard leaning against the entrance. This year there was a skeleton wearing a Santa outfit that finally drew me in. Inside I found Pete Leather working on an old Dutch bike. 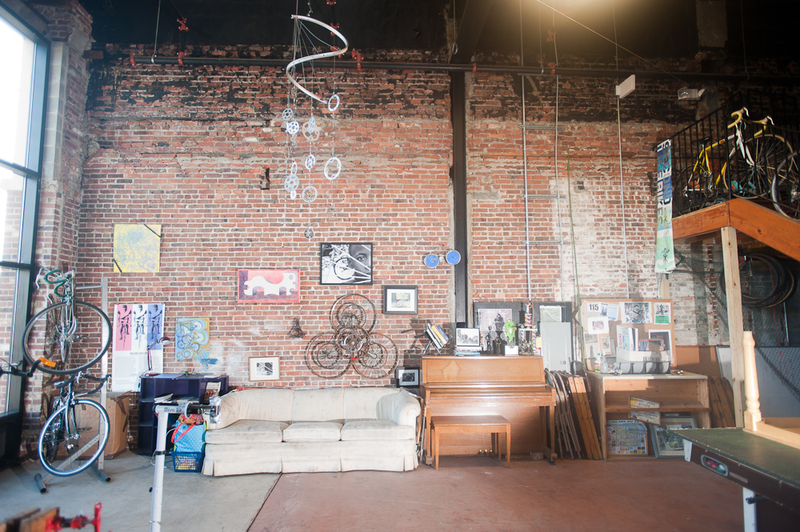 He explained the program and the history of Second Life Bikes and its founder Kerri Martin. 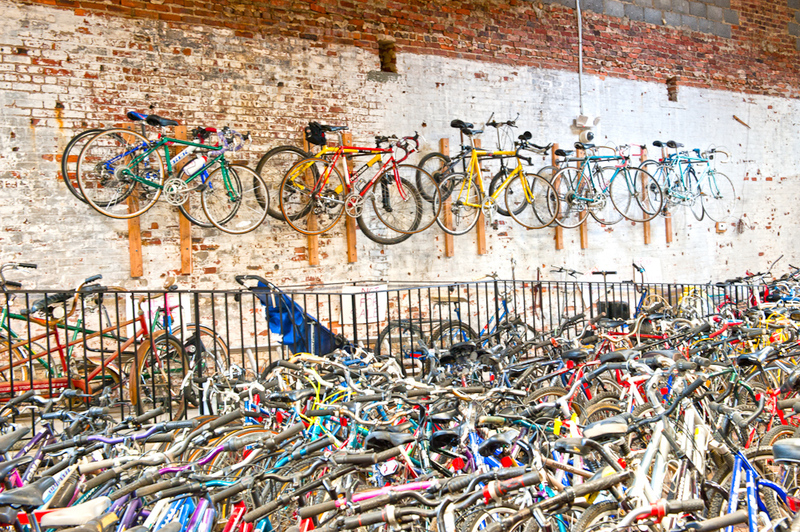 It is an enormous space defined by high exposed brick walls with hundreds of bikes of every size and share, including one unicycle. I had my camera with me and asked Pete if I could take some photos of the place as the visual repetition of the bikes, parts and accessories are one of my favorite themes. When I reviewed the photos that evening I liked what I saw and decided to return to take additional photos and I wanted to meet Kerri. 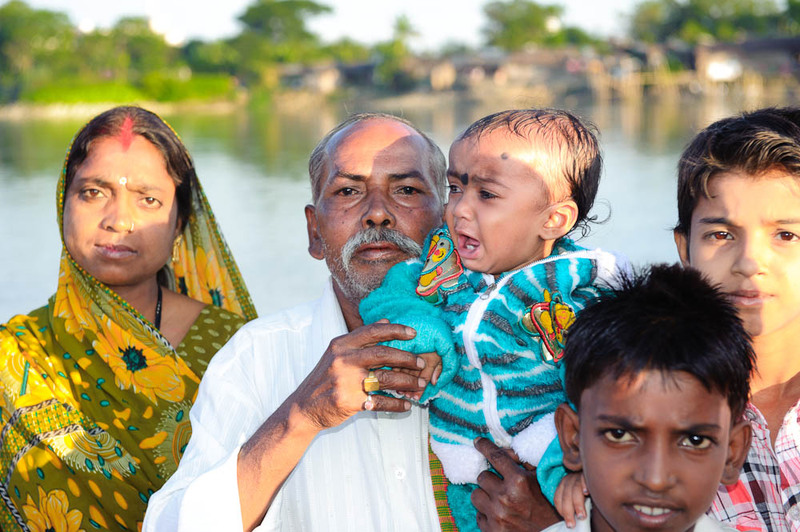 Jenni’s interest was piqued when she saw the photos and heard the story. So we returned together. Jenni discussion with Kerri follows and my photos are found in the Slideshow section. Kerri Martin hails from Freehold, NJ, born into what she describes as a very normal middle class family, an only daughter surrounded by three brothers. Appearing to be a delicate and sensitive beauty, she backpacked and biked extensively across Europe while in school. She’s actually backed by a core of steel with a heart as soft as a rose petal. She thought briefly about becoming a social worker but ended up working for a German investment company on Wall Street, a job that ended on 9/11 as she watched the plane crash into the World Trade Center as she biked down the West Side Highway. She immediately rethought her life and purpose. Kerri worked in Manhattan and Fair Haven and Brielle in New Jersey restoring and repairing bicycles until she made the brave decision to peddle off on her own and begin her own business in Asbury Park, NJ, an old resort town poised to return to her former glory by an adventurous alternative lifestyle population She utilized space in a garage located at Holy Spirit Church generously provided by Father William McLaughlin, then moved to the Jersey Shore Rescue Mission prior to finding space in Asbury Park in a location that most business owners would overlook. 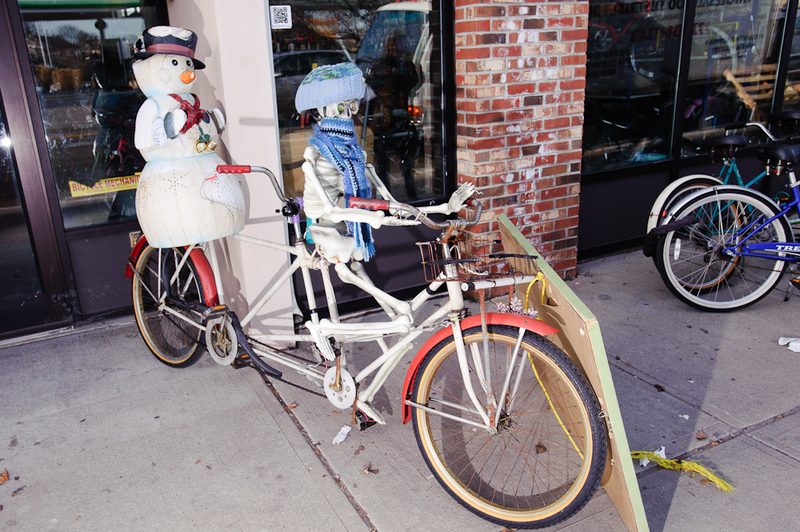 It turned out to be ideal for her blossoming bike philosophy: build it and they will come. 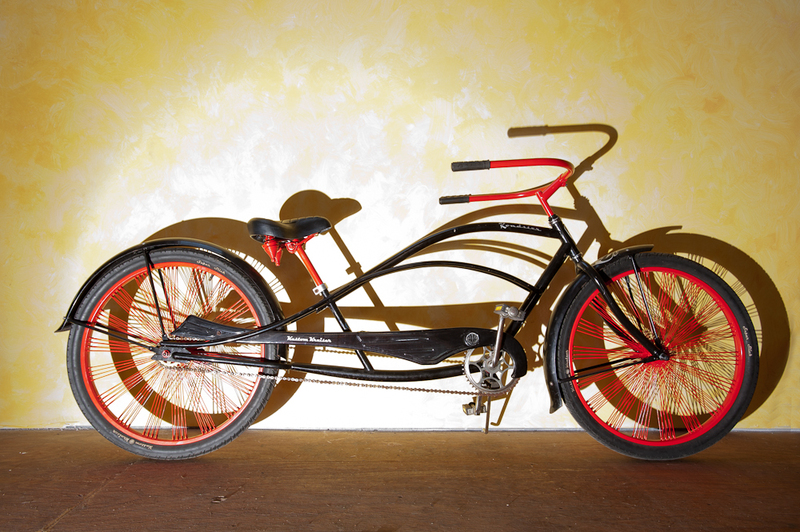 Second Life Bikes was born. 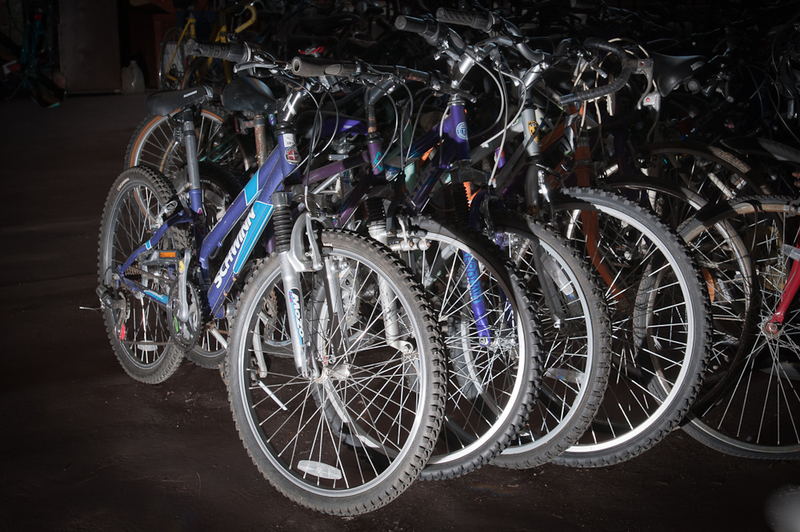 Accepting donations of used bikes in any condition, teaching kids how to repair bikes and having them earn by work effort to obtain bikes that they could otherwise never afford, business (if you can call it a business) is booming. Pete Leather, her right hand mechanic and equally brilliant conversationalist, have their hands full working long hours managing a myriad of curious visitors, teaching kids, fielding phone calls and walk in requests as well as customizing and restoring bikes. As Kerri reiterates, they aren’t really about customer service and business in the strict sense of the word. It’s about a passion for supporting and teaching an elemental way of life that has almost been lost in the suburbs of America. It’s a way of respecting the bicycle, no matter the condition, as a piece of functional sculpture and chronicle of history, and as a way of giving back to a community that provides a very satisfying life for a young woman whose feet are securely on the ground (unless she’s biking) with a creative genius and positive vision of growth in clear direction without surrendering her values. I began my trip to Nagaland (northeast India) in early November beginning in Dibrugarh in the State of Bihar. By a happy coincidence I arrived at the last day of the four day Chhath Festival. 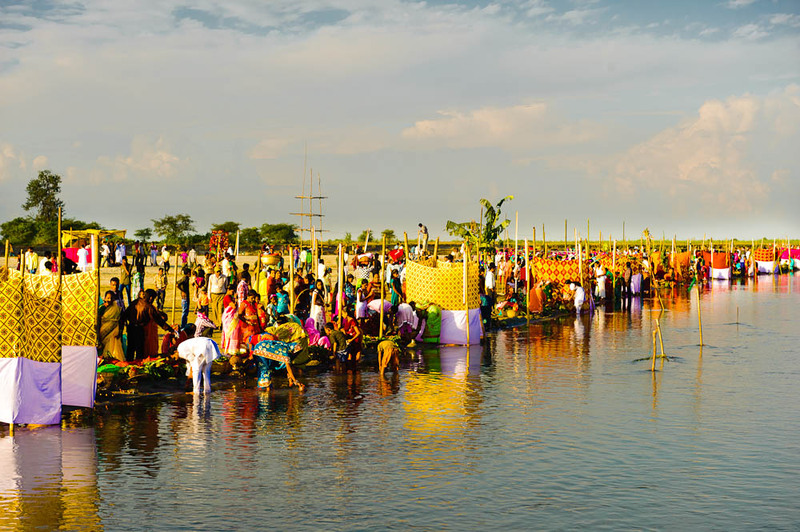 Although there are many festivals celebrated by the Hindus of Bihar, there is only one Hindu festival that is uniquely Bihari, and that is the festival of ‘Chhath’. Observed mostly by the people of North Bihar, it is dedicated to the worship of the Sun God and therefore, is also known as ‘SuryaShashti’. 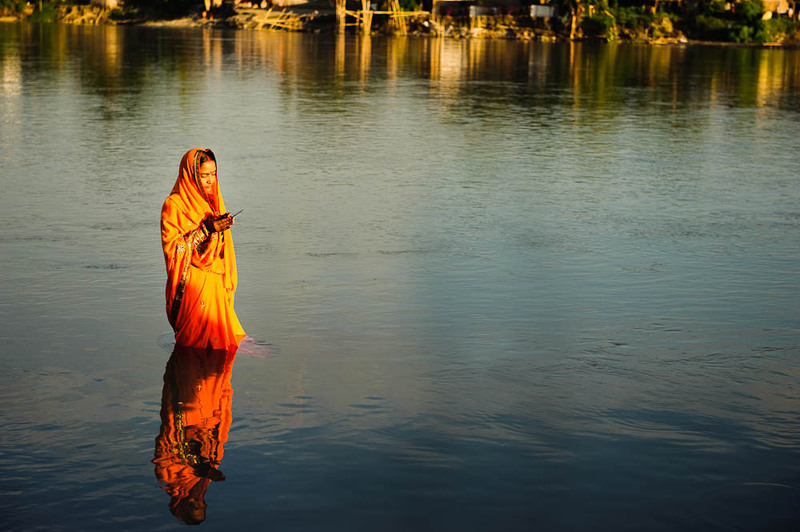 Chhath is considered to be a means to thank the Sun for bestowing the bounties of life on earth, as also for fulfilling particular wishes. 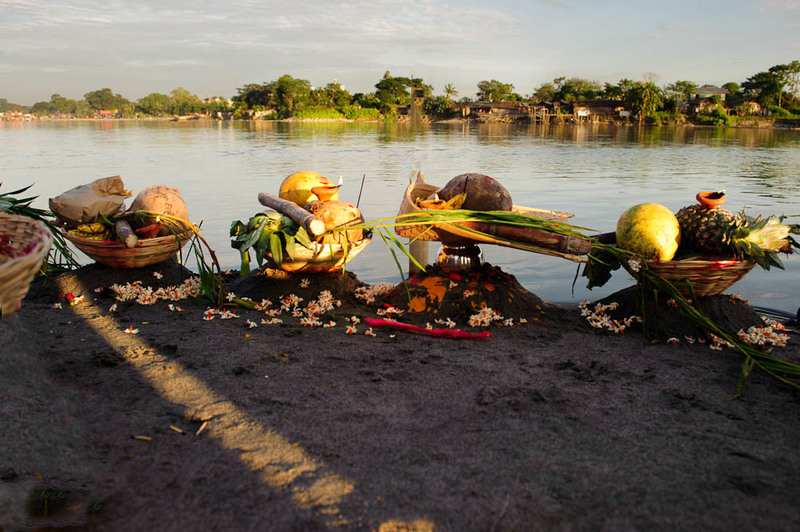 The word Chhath denotes the number six and thus the festival begins on the sixth day of the Hindu month of Kartik in the Hindu lunar calendar. 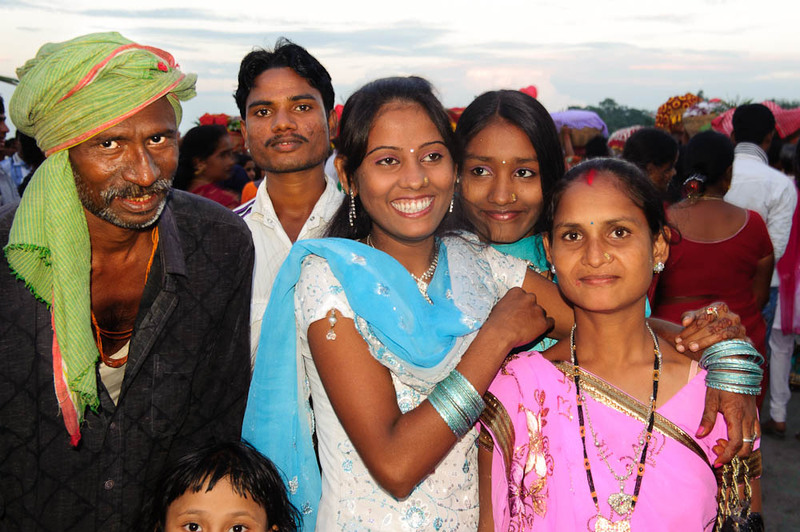 It is one of the holiest festivals for Biharis and extends for four days. 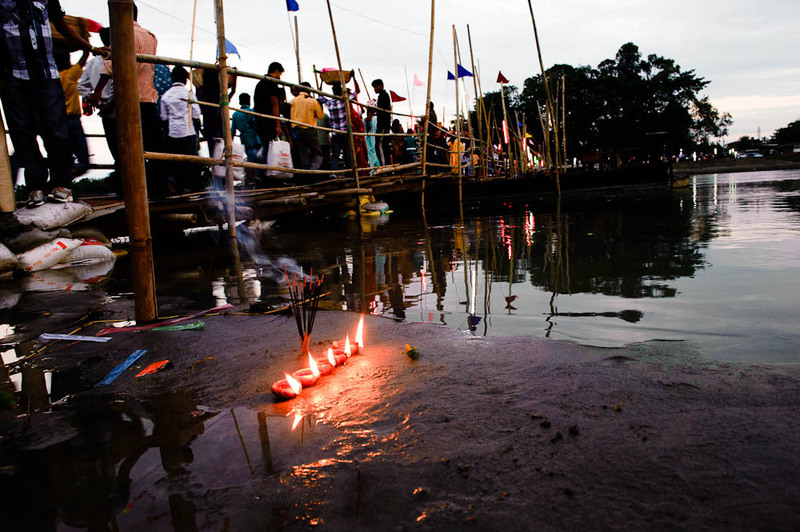 By the time I arrived at the Brahmaputra River both banks were lined with thousands of devotees with their offerings, candles and colorful temporary changing rooms for after wading into the river. Everyone in the area I was photographing made me feel very welcome. I received many invitations to join in for snacks and tea. I was invited to photograph entire families and gangs of boys. They could not have been friendlier. Carnaval 2010! San Francisco is another journal in a series published by Spirit House Productions documenting photographer Michael Morrissey’s odyssey around the world, into the heart, and through the lens of special times, places and those who inhabit them. San Francisco Cultural Arts Traditions, (SFCAT) strives to make multiculturalism a tangible reality by uniting people in the celebration of cultural arts traditions with music, dance, artistry and food, and through this endeavor, benefit our communities. San Francisco’s Carnaval celebration was initiated in Precita Park 32 years ago by its multicultural and multiethnic founders who dearly missed traditional Carnaval celebrations in their respective home countries. Musicians, dancers, artists and a host of local residents continue today to join together in San Francisco’s Mission District to create a rich fantastical day long tapestry woven throughout what must be one of America’s most colorful and joyful parades. The San Francisco Cultural Arts Traditions, current sponsor of the parade and formally established in 2009, is a cultural arts and education non profit organization comprised of members who celebrate both Carnaval and Cinco de Mayo. Please visit their website for further information on their efforts in the community. Beijing at night is a city painted in the glow of light, curtains of brilliant primary color bathing and outlining spectacularly designed international commercial skyscrapers, many fantastical in design, as we pass through the night on the road from the equally star spangled capacious airport. One of China’s newest cities at the tender age of 800 years, it has grown in population to 23 million and suffers from the modern plague of most international cities: traffic. To compensate for the increase in vehicles on the road during rush hours, Beijing has wisely created staggered office hours, but even at 8:30 PM the highways are operating at capacity. Chinese cities are undergoing rapid sprawl with few, if any, zoning regulations. The only hints of antiquity are the magnificent reproduction terra cotta warriors and horse at the airport. Our guide is a pleasant 27 year old woman named River (by her second grade English teacher). Her real name is Yangtze. Decked out in Northface and Adidas casual clothing, Nike running shoes and sporting preppie spectacles she could easily pass for a grad student at Harvard. Her expertise as a guide pertains to Beijing only and she will be our lifeline for the next two days while we explore the city. 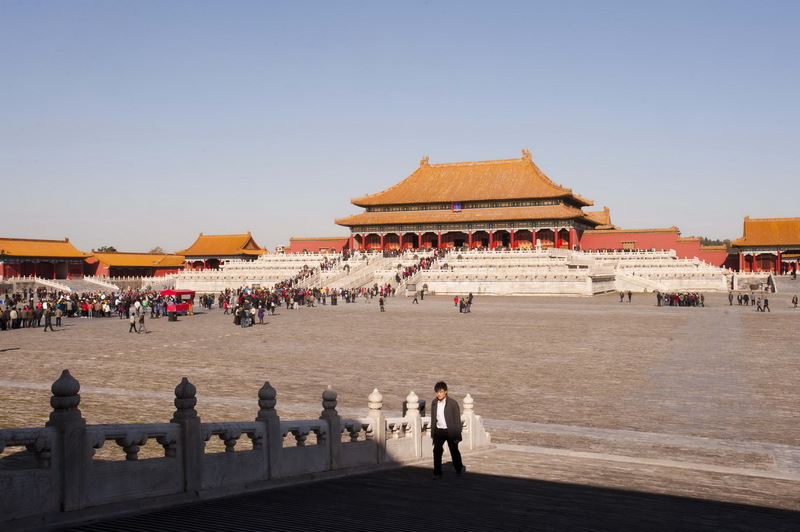 Beijing was the home to the last reigning dynasty of China and, as such, the architectural relics from that time have been remarkably preserved compared to the older cities where Emperors and their families once ruled and worshipped. As in many Asian cities tap water must be boiled prior to drinking, an amazing notion compared to the sophistication of the international commerce and structure of the place. We opted to have dinner in the hotel at the Chinese restaurant since we arrived late after a somewhat grueling 11 hour flight from San Francisco. Making our way through a lobby filled with touring Asian women topped by giant panda hats (adorable!} we were seated at a massive stone table, facing each other, almost six feet apart across the table! Picking through a menu filled with such standards as goose intestines and webs (think of where those little feet trod! ), jellyfish and preserved egg, we settled on chicken fried rice with pineapple and chicken stew with mushrooms. Tea was a refreshing and light inexpensive Jasmine, most often the tea served in restaurants and homes. The fried rice delicate and yummy, no trace of the heavy oils found in US Chinese dishes, yellow with tiny specks of pineapples, chicken, egg and bean. The stew! Ahhhh, the stew: small pieces of dark meat chicken chopped including tiny bones, difficult to chew. Do the Chinese eat those bones? (Heimlich!) I found a few small whole chicken hearts and some pieces of gristly or puckered stuff that could not be identified. Mushrooms were black, reconstituted from dried, and diverse, as if gathered from a forest floor. A Chinese group seated nearby busied themselves with Hot Pot, boiling their cabbage and meats in individual pots at their table. We’ve pushed ahead about 15 hours and our time clocks are just crazy, time to go to the room and settle in. Back in the room we unpacked a bit to check our electronics and inventory our clothing choices. Last week the weather was cold, in the thirties and forties, but this week temperate degrees are in order. 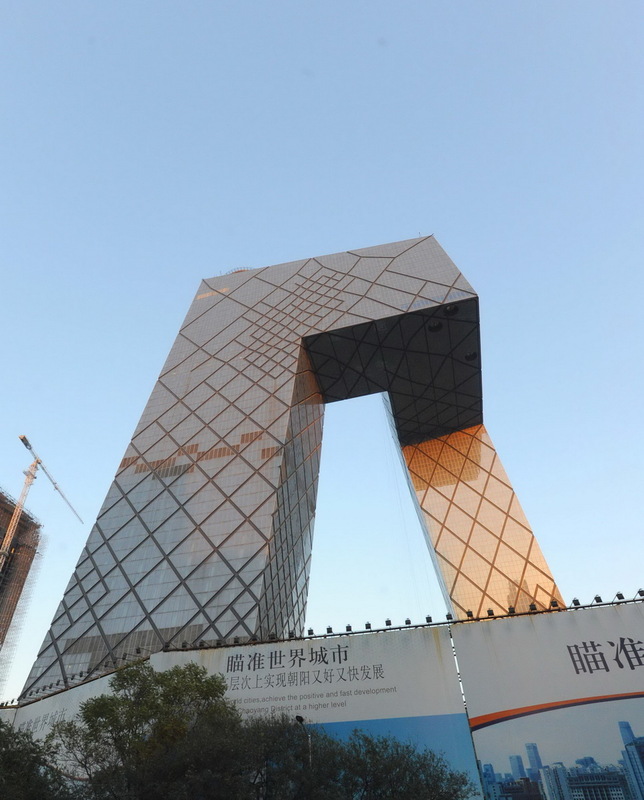 Beijing has short Spring and Fall Seasons, long and harsh summers and winters. Michael has wisely selected the short Fall for our visit and it is turning out to be the best week of the season. We watched table tennis for a while on the tv…crazy shrunken tennis sport with wily serving techniques and wild volleys. Hilarious to see them rubbing their shoulders after a big serve! Tough guys! In the morning prior to setting off we imagine the time before Mao when Beijing was a village without light and billowing international trade with sadness. We remember the countless professionals, musicians, academics and young people who were robbed of their talents and heritage , hopes and dreams during the Cultural Revolution. We are off and running on a brisk city walk prior to a drive to Tian’anmen Square and the glorious Forbidden City. We’ll tour the Temple of Heaven where Emperors prayed for good harvests the morning of our departure and tomorrow we’ll visit a portion of the Great Wall (a tourist must). Also on the agenda is a visit to a hospital built by a friend and neighbor in California. Small world! We are up early, breakfasting at a typical Asian breakfast buffet with an assortment of Chinese and International foods. Compared to Bangkok, it is clear that food is dear here. More starches, less protein, the ever present rice congee joined by corn congee and baked beans…always baked beans. Dressing for the crisp Autumn morning, we head out on foot to travel down Beijing’s Walking Street, an impressive wide road stretching far as the eye can see In either direction lined with luxury stores that one would find on Rodeo Drive in Beverly Hills or New York’s Fifth Avenue. The air is sparkling clear and without a trace of the famed Beijing pollution which threatened the performances of the Olympic Summer athletes in 2008. There are many prosperous and wealthy Chinese in the present economy and they are eager to purchase the bling items popular in the rest of the developed countries, items that signal conspicuous consumption, possibly a reaction to the frugality of the previously enforced Cultural Revolution. We note a huge black fully decked out Hummer in a parking lot joined by a green soft top Jeep with New York license plates! We spend some time in the plaza of a large Chinese Catholic Church. I am asked to have my photo taken with a few young men and women. In Asia, I’m often asked to perform this request which always results in warm laughter and lovely exchanges that somehow bridge the gap of language. It’s a blonde thing! I’m a freak! We return to the hotel to join River and our driver for a day on the road. I’m excited to see sights I’ve read and dreamed about. Following are some brief descriptions that can only weakly detail a day that was both visually and emotionally saturated to the point that I journeyed beyond words. Tiananmen Square is impossible to capture in photographs. Even with the use of a wide angle lens. Vast is the most descriptive word. Empty even with the thousands present this day, the space and the huge government buildings that line its boundaries could easily dwarf a million bodies. Between the first gate of the Forbidden City and the Mausoleum of Chairman Mao stands a monument to those who lost their lives for the defense of the country in previous world wars. No mention of those students who bravely protested in the widely publicized protests of 1989, some losing their lives. The massive road that separates the old palace grounds from the square is designed to host potentially the entire Chinese population on parade days. On the birthday of the “new” China in October, the day is wildly celebrated in a massive parade. We in the West cannot appreciate the nationalistic pride the Chinese people take in their country, despite the politics, despite the hardships. That is all that occupies my mind and heart while standing quietly in this huge void. Dissent and unrest of most of the population at the turn of the twentieth century caused by American and European designs on the empire and the conversion of multitudes to Christianity eventually brought the end of the Dynasty reign. Japan played her part in the attempted control of China when help was needed the most. River was only six years old at that time that Mao’s dictates prevented her parents from attending university but they did obtain government jobs which provided stability and chance to afford to raise their only child. Although I bitterly oppose Maoist doctrine and the devastating effect it had on one of the world most developed civilizations, I’m old enough to temper my prejudices with maturity, education and the perspective of others. As River points out, women’s feet were no longer bound to resemble those of a doe. Women were granted equal rights. A middle class developed with opportunity to become educated. But it took much suffering over a number of years and the abdication of the last emperor marking the end of one of the great periods of civilization to follow the reigns of the pharaohs in Egypt. One wonders how China might be today if the last emperor Pu Yi would have continued his modern education and opened a path similar to Britain, Thailand, and Sweden where a monarchy is maintained while allowing more progressive governments to rule by the people. River says: “We Chinese are crazy, we will believe in something for a thousand years, even if it’s wrong!” A brilliant statement from a special young Chinese woman with one foot in the future, the other in the past. The Forbidden City is more a universe than a city, containing a collection of planets inhabited at one time by denizens of those who served the Emperor as well as the Emperors family. Eunuchs, concubines, scholars, physicians, musicians, counselors, serving staff, all assigned to certain locations and levels of access gained by passing through a series of huge gates. 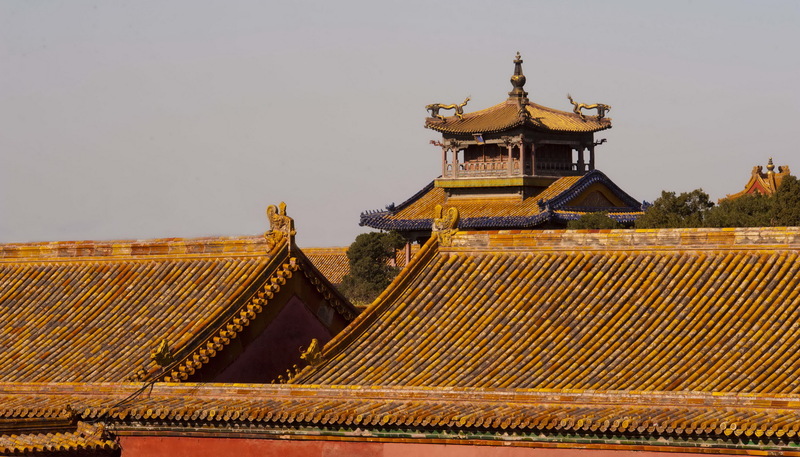 The Forbidden City was home to two Dynasties, Ming and Qing. From the time that the last emperor fled the compound as the Chinese troops marched in to arrest him, his family was allowed to remain for thirteen years. Many Chinese believed that he would return to the throne, that there would be one more reign of an emperor. It was not to be but one can view the living and bedroom chambers of the Empress, Emperors and concubines exactly as they were. Please view Michael’s photographs for I cannot provide adequate descriptions of the elegance, enormity, and profound majesty of the enclosure. And watch the marvelous film The Last Emperor, taken from Pu Yi’s autobiography, written while he was undergoing 10 years of ‘rehabilitation’ courtesy of Mao. To stand at the top of the stairs in the innermost courtyard where the Emperor could view the masses of his inner sanctum as he addressed them on holidays is nothing less than spectacular. It is a stunning testament to the end of the Dynasty rule in China. The convoluted and intriguing behaviors of the Emperors and Dowager Empresses can be imagined as the private rooms and gardens are visited. The Emperors bed, where concubines were placed naked each night by eunuchs appears to await them. The throne remains in place behind which The Dragon Lady Empress whispered orders through a wall of bamboo to a mincing young emperor, too weak willed to rule on his own. On the way to the Temple of Heaven, we decide to stop first for a hike up the Drum Tower and a rickshaw ride through a one story community called a Hu tong, Before clocks and the common availability of watches, two enormous towers, Bell and Drum, gonged and bonged their way across the city every two hours. We huff and puff climbing to the top of the Drum Tower (very high 69 steps!) just in time to watch the drummers, lead by a young woman; beat out a fantastical symphony of hard driven beats. 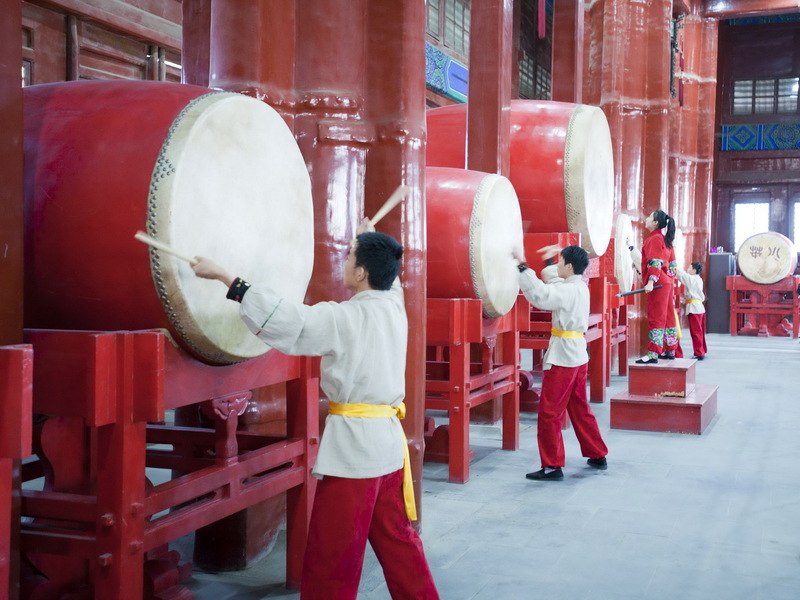 See the photos to understand the enormous size of the drums and the power of the drummer’s sticks, full body efforts to hit those things! When fully functional 24 drums are used. We did not hear the bell toll, but it is presumed to be one of the largest bells in the world and that tower faces the Drum Tower. From the balcony we view across the one story old city to the park beyond whose summit lies the Forbidden City. To the West, the new Beijing of sky scrapers and light. Descending back to ground level we linger for a moment to watch neighbor men training birds, gorgeous yellow beaked gray winged larger than a robin birds trained like pigeons to fly from the hand, circle in the sky, and back to the palm for a treat. Pigeons are also raised on rooftops for racing. Pigeon eggs are not eaten as they are considered to be too valuable. Into the rickshaws we glide through the tiny streets meandering through bicycles, pedestrians, some cars, and children as they let out of school. There are never many babies or small children out and about and those that are seen are doted upon. In the city the one baby rule is strictly enforced. Married to a foreigner, farmer or minority culture (and there are many in China) two are permitted, sometimes more for farmers. We stop at a house owned by a middle aged woman who inherited the tiny place from her grandparents. The doorways of houses are decorated simply but with meaning. For the middleclass and lower color may only be used around the doorframe. No yellow, that is reserved for royalty. Green is the color of the common people. Red is the sign of fire and good luck and used for celebration. Pillars and beams at the doorway can define who works for the government, the police, and who has money. Despite the Cultural Revolution tradition dies hard in China. High on a dune at sunset over the Sahara, at a spot where salt caravans have been unloading their cargo for centuries, Oumar sits on a crest of sand as fine as powdered sugar and prepares a charcoal fire within the bowl of a delicate brass stove. His turban is crafted with indigo dyed cotton, a deep Taureg blue. Blue is the signature color of his nomadic tribe, one that predominates in the ancient city of Timbuktu and is responsible for the independence of Mali. In fact, there is still Taureg unrest simmering across the Sahara which includes the kidnapping of tourists but tonight hospitality is in order. We have just concluded a camel ride accompanied by a thicket of children (as well as thickets of ticks covering the camels) and turbaned Tauregs, winding our way through small villages and encampments as the sun sinks slowly over the hazy horizon. The tea is brewed from mint leaves and other spices added to a small tea pot of boiling water allowed to steep for a minute or so before decanting. The pot is held high above small glasses by the host and poured with an up and down motion suspended over the glass which creates heavy foam. Women are served first. In this tradition the first brewed cup is bitter, like death, the second is strong, like life, and the third, served with copious sugar, is sweet, like love! Glasses are often shared in this lovely communion of spirit. All conversation stops as the host presides over this ancient celebration. The dream like atmosphere totally enraptured me as I sat curled under my long skirt; bare legs tucked beneath me buried in the grains of warm, soft sand listening to story after story incanted by Oumar, his mesmerizing words spun out like sugar drops against the melting sky. Also sitting on the desert just a short distance behind Jenni and Oumar is Mohammad, our driver. Just before Jenni invited me to join them on the sand Mohammad leaped to his feet and was dancing around jumping from one foot to the other while pulling off his pants. So what does it take for a devout Muslim to shed his pants in front of a foreign woman, you ask? How about a scorpion. I didn’t want to ruin the moment. Jenni was mesmerized by Oumar, his tales and intoxicating tea ceremony. When I eventually responded to the LOOK, my reward for not ruining the moment was a totally undeserved whack on the head with her camera bag. And so it goes here on the edge of the end of the universe in Timbuktu, were nobody knows your name. While on safari in Masai Mara, Kenya, we were intrigued by a colony of baboons nesting in a large tree on the banks of the river running through our camp. Each night, one by one, they slowly ambled toward a clearing on the savannah and settled into the equivalent of primate lotus positions to view the setting of the sun. The softness of the Mara is blanketed by the sun bleached skeletons of cows, often punctuated by complete hides covering the bones, tanned by the heat and ignored by vultures. There has been too much food available for them to rip the flesh from the remains of many of these gentle beasts herded to the Mara in search of grass and water during the drought from as far away as Mt. Kenya by their keepers. Along the way they dropped from exhaustion, dehydration and starvation, often walking up the steep escarpment, away from the trickle of the river. When a cow goes down, that is the end, there is no help for them and they die, eyes cast toward the billowing clouds carrying moisture that they could not reach. Only the great beauty of the Mara savannah, the majesty of the acacia and euphorbia, the drama of the escarpment, and the constant dance of life and death taking place before one’s eyes can erase the signs of death desolation caused by the drought. The Mara is truly a heaven on Earth, the birthplace of humankind, home to the greatest predators on the planet, the most graceful grazers in plentitude, and the place that the mighty Masai and their cattle inhabit with purposeful reserve. At our camp on the escarpment, high above the plains, almost as high as the clouds that sail over the vast grassy stretches, there was a killing at night a few weeks prior to our stay. Six tents are perched on the edge of the cliff, each hidden from the next with an unobstructed view of the sunrise over the Mara. We are a five minute walk from the dining room and that is where at night, just outside the building, a male lion grabbed a zebra and ate his fill. We were asked to call for a guard via private cell phone when walking at night, and the Masai guard would walk with us, flashlight and spear in hand. Some had handmade bow and arrow. The Masai grow up guarding their flocks from lions, cheetah, and leopards. They are tough and resolute. We are wondering how one Masai with a spear can protect us. At night, while lying awake within the tent, one hears the soft growls of the great cats talking to each other while they prowl, the beautifully odd calls of hyena as they organize a hunt, the hilarious bellowing roar of the male hippos back at the pool calling for relief from their shift at guard while the rest of their family munches grass through the fields until morning. It is widely acknowledged in Africa that the hippo is the most dangerous animal on the continent, killing more people than any other animal if their way back to the pool is blocked. One bite is all it takes. Their huge upper and lower teeth can cut a human in half although they use their delicate lips to forage for and eat grass. After a sunrise we took a balloon ride piloted by a colorful American who Michael met on a previous Mara trip.